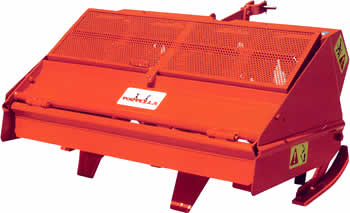 A spader is good for the soil! Soil compaction is the nemesis of soil structure. Gradual compaction from increased tractor activity can quickly destroy a soil’s health, turning soils that were once vibrant and complex into mere dirt. 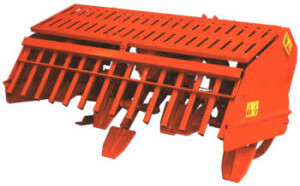 Reviving the soil’s “tilth”, or healthy structure, can be immediately impacted by the use of a spading machine. It will turn hard, compacted soils into deeply fractured structures while avoiding mixing sub-soils with surface soils. By fracturing surface compaction and lower-level hard pans, drainage and aeration are immediately improved. At the same time, green manures and crop residues can be effectively incorporated into the soil profile. Most important, all of this can be accomplished in a single pass. V05-075 29″ 10″ 15-25 4 565 lbs. V05-100 39″ 10″ 15-25 4 583 lbs. V05-120 47″ 10″ 20-30 6 704 lbs. V25-100 39″ 12″ 30-50 4 924 lbs. V25-120 47″ 12″ 30-70 6 1,210 lbs. V25-135 53″ 12″ 35-70 6 1,278 lbs. V25-145 57″ 12″ 35-70 6 1,320 lbs. V25-165 65″ 12″ 35-70 6 1,396 lbs. V35-175 69″ 12″ 50-90 8 1,936 lbs. V35-205 81″ 12″ 55-100 8 2,039 lbs. V35-230 90″ 12″ 70-100 10 2,618 lbs. V35-255 100″ 12″ 70-100 10 2,750 lbs.